Students will find numerous small chips of 12 common minerals in a natural gravel, then observe and test their physical properties. 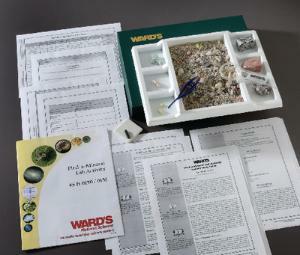 Three common rock samples are also included to illustrate how small mineral grains are found as constituents of various rock types. Each set comes with a one-pound bag of concentrated mineral gravel, streak plate, magnet, magnifier, sorting tray, forceps, rock samples, a teacher’s guide, and student copymasters, all contained in a convenient storage box. Average chip size: 3/8– 1/2". 470015-398 WARD’S Find-a-Mineral Lab Activity, Replacement Gravel, 1lb.